How to Test your Sixth Sense (Psychic Ability)? There exists a subtle intangible world that is infinitely vast compared to the entire tangible world that we know of. This subtle world vastly influences our life. Hence it becomes imperative that we know about it. Since this world is in the subtle dimension, it cannot be perceived with our gross sense organs, mind and intellect and can be perceived only via the medium of the sixth sense. This section is devoted to help the readers to test and train their sixth sense and also monitor its development. 1. What is a subtle experiment to test our sixth sense (ESP)? 2. What is the aim of this section of the website? 3. What is the aim of a subtle experiment? 4. Why is it important to know about the subtle dimension? 5. How does participating in the subtle experiment help? 6. How to conduct a subtle experiment? 9. How should we use our sixth sense (ESP)? 10. What happens when sixth sense (ESP) is misused by a person who is a psychic? Our sixth sense (ESP) is our ability to perceive the subtle dimension or subtle world. A subtle experiment is a means of testing and training ourselves to use our sixth sense (ESP). We define the subtle dimension or subtle world as the world which is beyond the understanding of the five senses, mind and intellect. The subtle world refers to the unseen world of angels, ghosts, heaven (Swarga), etc. which can only be perceived through our sixth sense (ESP). We are all well accustomed to using our five senses, mind and intellect to analyse and perceive stimuli. This is because our entire education system is geared to teach us only to use our five senses, mind and intellect in analysing situations and problem-solving. Modern sciences generally ignore the subtle dimension as it cannot prove its existence using traditional measurement and analysis tools. Unaware of the existence of the subtle dimension or subtle world. Unequipped to use our sixth sense to experience the world beyond the seen world. Through this section we strive to encourage the use of the sixth sense in society. By relearning to use their sixth sense (ESP) people can experience the subtle dimension or subtle world. An experiment (of modern sciences) is conducted to get a deeper understanding of the physical or psychological aspect of the subject in question. The ability of the subject to attract or emit divine or negative energy, etc. These aspects are beyond any cultural influence or cultural bias. Please read the article on the three subtle basic components. 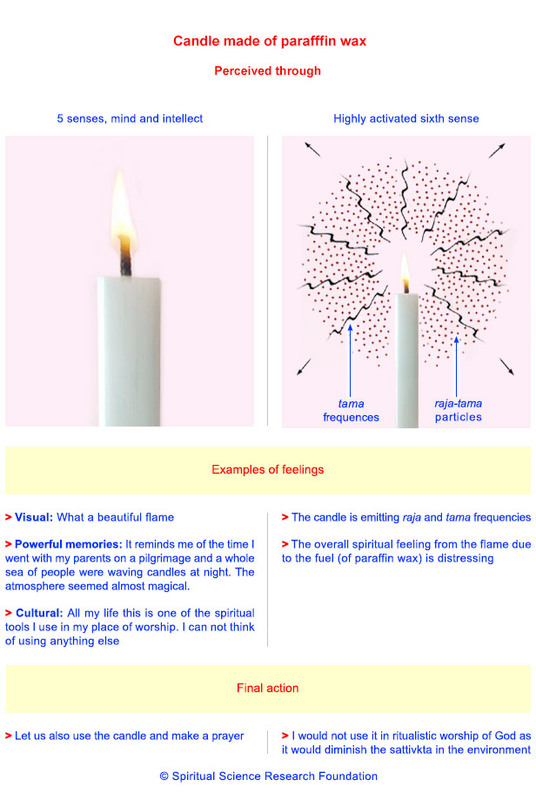 Let us take the example of a candle and how our perspective changes depending on what medium we use to experience it. Unknown to most of mankind, there is a vast subtle and intangible world beyond the understanding of our five senses, mind and intellect. This world is also known as the subtle world, subtle dimension, spirit world, spiritual realm or spiritual dimension. It includes the world of angels, ghosts, heaven, hell, etc. The tangible or known world that most of us are familiar with is very small as compared to the subtle intangible world. In fact the extent of the known world as compared to the subtle world is in the ratio of one is to infinity. This subtle world hugely influences our life both positively and negatively. Many of the problems and difficulties in our life are due to harmful influences from this subtle world. Our ignorance and inability to perceive and influence the subtle world render us helpless victims to these harmful effects. It also deprives us of the opportunity to enhance our lives spiritually. Since the subtle world affects every aspect and step in our life, having knowledge about it helps us take correct decisions that will help us promote happiness, contentment, success, etc. and protect us from its harmful influence. We get a first hand experience about the existence of the subtle dimension. 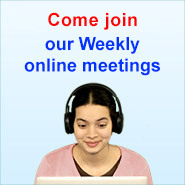 We begin to understand that something exists that is beyond the understanding of our five senses, mind and intellect. We get an idea of our ability to perceive the subtle dimension. We train ourselves to use our sixth sense. We get to learn more and more about the subtle dimension. If we have started spiritual practice, we can use these tests as a meter to check our progress. One of the effects of spiritual practice is the activation of our sixth sense. The more the spiritual growth or spiritual level the higher the ability to perceive the subtle dimension. Stage of life, for example the way a person views a situation as a mother would be different to the way she would view it as a young adult. These filters influence our thinking and judgement but they are relative to place, time etc. In the above example of the candle, one would be culturally swayed into perceiving the candle as a good choice for use for prayer. If we were to have a highly activated sixth sense, our decision making takes into account many more parameters that are absolute (i.e. not relative) as is apparent from the subtle view of the candle. When we use our sixth sense in our assessment of things, we are less likely to make mistakes. Let us look at a couple of examples of how this happens. Dave and John are discussing about getting into a business venture together. Dave has not known John for long. By looking at John, Dave feels that John is very professional, really knows his stuff and will be an asset to the venture. However if Dave had an activated sixth sense (ESP), he would be looking to see if John was a Sattva, Raja or Tama predominant person. If he perceived that John was a Tama predominant person, Dave would know that John for all his professionalism in the good times would stoop to the lowest levels in adverse times. As a result Dave would not get carried away by the superficial aspects of John such as his smooth talk or level of knowledge etc. and would not get into a deal with him. Steve gives his fiancé, Kim a gold necklace which is a family heirloom of his great-grandmother who has now passed away. Kim is flattered by the gesture and vows to wear it as token of their love. What Kim does not know is that Steve’s great-grandmother was very attached to the necklace and is haunting it. Moreover she does not approve of Kim. As a result, the vibrations from the necklace are distressing. Kim would not know that the necklace is actually the cause of a series of problems now unfolding in her life. If Kim were to have an activated sixth sense (ESP) she would immediately be able to perceive the distressing vibrations of the necklace and not wear it. In the same way, when we do a subtle experiment to test our sixth sense, it is important that we ignore physical, psychological and intellectual influences. We need to instead try to perceive the subtle intangible vibrations emanating from the subject. The following are the steps that need to be taken in conducting a subtle experiment. Clear your mind by chanting the Name of God according to the religion of your birth or just concentrate on your breath. Do this for 2-3 minutes to achieve some level of concentration. Focus your attention on the figure and observe how the figure or object affects you at a subtle intangible level. Note your reading of the subject and all the nuances in your experience of the object. For example, at first one may experience restlessness which may further give way to a headache with an uncomfortable tingling sensation at the back of the head. Your reading can be positive, negative or neutral. A pleasant sensation or vibe could be that of slowing down of the breathing rhythm, pleasant coolness, a nice warm feeling, pleasant pressure like feeling, decrease in thoughts, increase in the quality of chanting, feeling of peace, contentment or happiness, seeing white light or a mental image of white light, etc. No matter what the specific experience, the underlying feeling has to be one of pleasantness or positivity. It is a feeling of wanting the experience to continue. An unpleasant sensation could be that of difficulty in breathing, headache, pain, nausea, distressing cold, heat, constricting or distressing pressure, negative thoughts, getting a vision of the object in dark, black tones, vision of strange or creepy figures, etc. Here the underlying feeling is one of unpleasantness or negativity. It is a feeling of not wanting to continue that experience. A neutral experience would be where one does not experience any change in one’s feeling while looking at the figure. When we start trying to test our sixth sense quite often we may get our readings wrong until we build our ability to discern through our sixth sense. The following are the factors that influence the reading we obtain when doing a subtle experiment. Influence of negative energy on the person conducting the experiment. For example the distress experienced from observing an object maybe because of the ghost possessing one. A ghost will find negative vibrations pleasant and positive vibrations unpleasant. A person who is possessed is unable to discern whether the thoughts and feelings are actually his or of the possessing ghost. It has been observed that with regular spiritual practice, people who are possessed are able to differentiate their thoughts from the possesing ghost’s thoughts. The higher the power of the possessing ghost the longer it may take to seperate the possessed person’s consciousness from the consciousness of the ghost. Psychological attachment to the subject thus clouding the clarity to take the correct subtle reading and influencing the reading regardless of whether it is correct or incorrect. Quite often it has been observed that people get the experiment right when their eyes are closed. However when they repeat the experiment with their eyes open they get it wrong. This shows the power that the psychological and intellectual influences have over our sixth sense reading. Do not get disheartened if you do not get it right the first time. Over time and with regular spiritual practice your sixth sense will begin to grow. Person with slightly activated sixth sense – is able make out just whether the subtle energy associated with that object is positive or negative. Person with highly activated sixth sense – is able to give definite information of various subtle aspects of the object, such as the type of energy, the strength of the energy, the time factor of association of that energy, etc. For example, we could use our sixth sense when buying a couch. The intention would be so as to get a couch that would emit positive or Sattva predominant vibrations that would help in a more spiritually conducive atmosphere at home. This in turn would facilitate spiritual practice at home. Couches that are dark in colour generally emit distressing frequencies compared to lighter colour couches. to protect oneself from the ill-effects of negative energy being emitted by the subject. We come across many psychics who use their sixth sense to guide people on various worldly issues. They range from answering questions such as, ‘When will I get a boyfriend’ to ‘Should I take this business venture’. 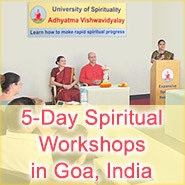 From a pure spiritual perspective, it is considered misuse of sixth sense when it is used for purely worldly matters. There is a gradual decline in psychic ability and the person may lose their ability entirely in time. This generally happens over a 30 year period. The psychic becomes target of subtle-sorcerers (māntriks) of higher spiritual strength. Subtle-sorcerers initially give some genuine information about the future, enough to gain the confidence of the person. However they later gradually mislead the psychics and the people they are guiding. In such cases, their psychic ability lasts for longer periods and may in fact appear to have improved steadily. But this psychic ability is not by virtue of the person but because of the subtle-sorcerer who is guiding/controlling the psychic. In such cases, the rare gift of sixth sense available to the person that could have been utilised for God-realisation is wasted on lesser matters. Along with this over the passage of time, the psychic quite often is totally under the influence of the subtle-sorcerer. Most psychics deal with subtle bodies that are very likely to misguide when providing an answer. Click here for the list of subtle experiments.